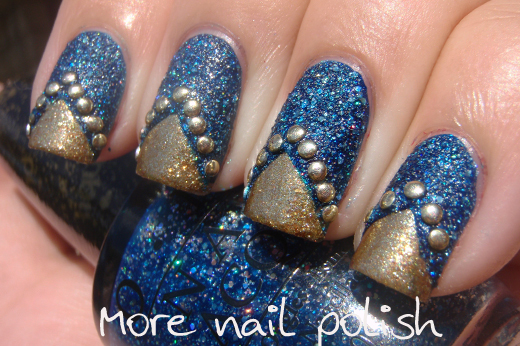 Here is another blue mani that I was absolutely in love with, but sadly my photos aren't great. It was only after I had removed my polish and uploaded these photos to my PC that I discovered the foggy nature of the images on the left half of the image. When I inspected my camera, I spotted one very large fingerprint the size of Miss 2's right across the lens! Doh! I really should remember to check these things before taking photos and removing my polish. Anyway. 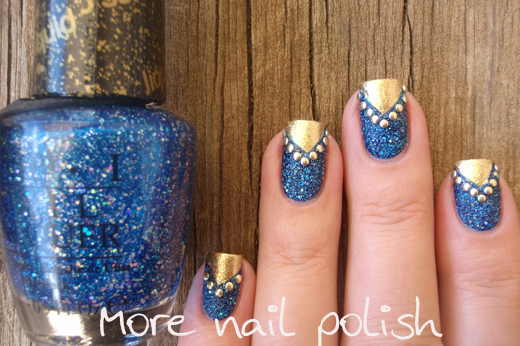 I created this mani by painting my tips in gold, using Zoya Ziv. After that dried, I taped off the chevron tip and applied one coat of OPI DS Fantasy. On top of that I put one coat of OPI Get Your Number. Because it was layered over the darker blue, the colour is so much richer, but the textured finish is still obvious. 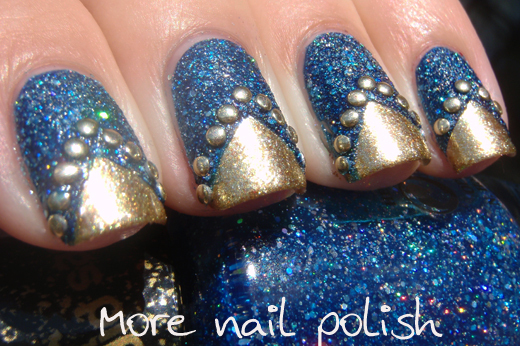 While Get Your Number was still wet - which is easy cause it takes ages to dry - I pushed the small round gold studs into my polish along the chevron line. Dont forget the polish auction that starts on the 20th of April. 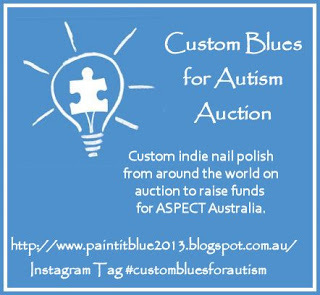 There are so many amazing polishes up for auction to raise money of ASPECT Australia. 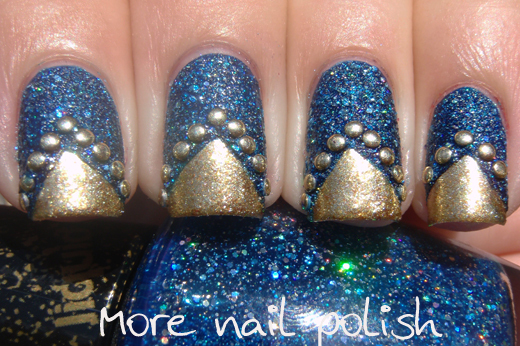 Check out the below blog site for swatch picture previews of some of the available shades. Wow this looks absolutely fabulous! Very nice manicure! I love the way you use the textured polish.